La India Canela in the studio. Photo by Daniel Sheehy, Smithsonian Institution, 2007. Lidia María Hernández López, "La India Canela," was born in El Limón, Villa González, a tobacco-growing area in Santiago Province of the Dominican Republic. She is the first professional musician in her family, though her father and brother played recreationally. "In my house there was an accordion because my older brother played, and at the time there was no television, no radio, nothing. What there was, was an accordion to play with. So that's how I began playing." Both terms in her chosen stage name refer to her skin color: india is the preferred term for mulata in the Dominican Republic, and canela carries the additional connotation of sweetness and spiciness. Recognizing her talent, her father took her to stay with Miro Francisco, a famous saxophonist, who also played accordion. The apprenticeship was not always easy: "Sometimes from Guananico we would go to Hatillo Palma, traveling the whole Línea region on a motorbike he had. We had to get on that little bike with accordion and saxophone and fight our way through all those hills to go there, and then we would return at two in the morning. It was 70 or 80 kilometers, and sometimes our gas would run out. We'd have to stop people to give us a little gas, and it was cold up there!" Then one day, Juan de Dios, Fefita la Grande's saxophonist, passed by her house and said, "We're going to make you a group!" She remembers that next, "He went to my house with a whole mess of musicians, and we sat under a shelter and had a sort of tryout, and he said, 'Let's go to Santiago.' So I took off for Santiago with that group." She was 14 years old. La India's mother loved music and was excited for her daughter, but her father was worried and didn't want to let her go. Family and friends eventually convinced him, saying, "You don't know if that's her future." Music was indeed her future. She took advantage of being in Santiago to learn from Siano Arias, Rafaelito Polanco, Lupe Valerio, and Rafaelito Román, and went on to record several albums and win two Casandras. (The Casandra is the Dominican Republic's highest prize in the arts.) However, "the best prize that one can win is the sentiment of the public, the people who appreciate and admire you." 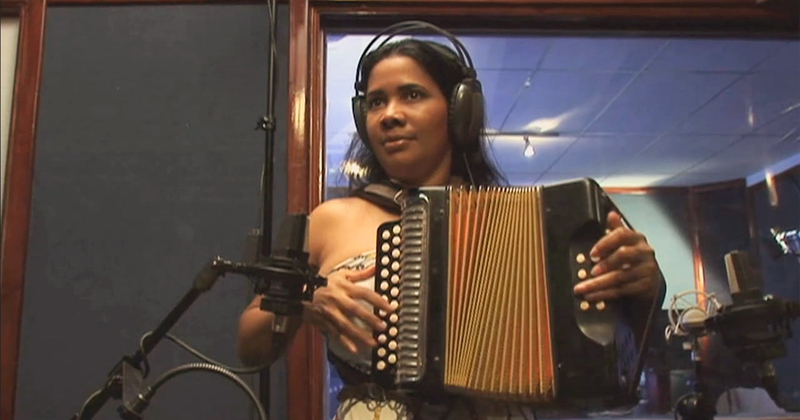 La India is also happy that, in turn, she has influenced a younger generation of female accordionists: "It has been a great satisfaction for me that some of the young women have come up to me and said that they have seen in me an example to follow." La India is the leader of a merengue típico band. Merengue is widely recognized as the national music and dance of the Dominican Republic, and one of the country's most important exports, but it is not a single, unified genre, and some of its stylistic variants are scarcely known outside of the communities who play and consume it. The traditional style called merengue típico is so important to daily life in the northern Cibao region and among cabaeños abroad that musicians describe it as "soul food" and even, metaphorically, as "family." Yet to date, it has not reached the same audience abroad, or attained the same social status at home, as has its cousin, the pop or big-band merengue called merengue de orquesta. Típico sounds quite different from the big-band merengue more commonly heard abroad. It is centered on the accordion (rather than wind instruments), percussion plays a key role, and improvisation is central, while big bands rely on written arrangements. Women accordionists lead several otherwise all-male groups. Women in típico present an interesting paradox. Except for the occasional novelty girl-group, female instrumentalists are seldom seen in other Latin American popular musics. Women típico leaders became popular at the same time Dominican women entered the workforce in the 1960s and fiery performer Fefita la Grande began a nearly fifty-year career in típico. Yet evidence of female accordionists stretches back to the early twentieth century, suggesting that women have always played the style within the home. 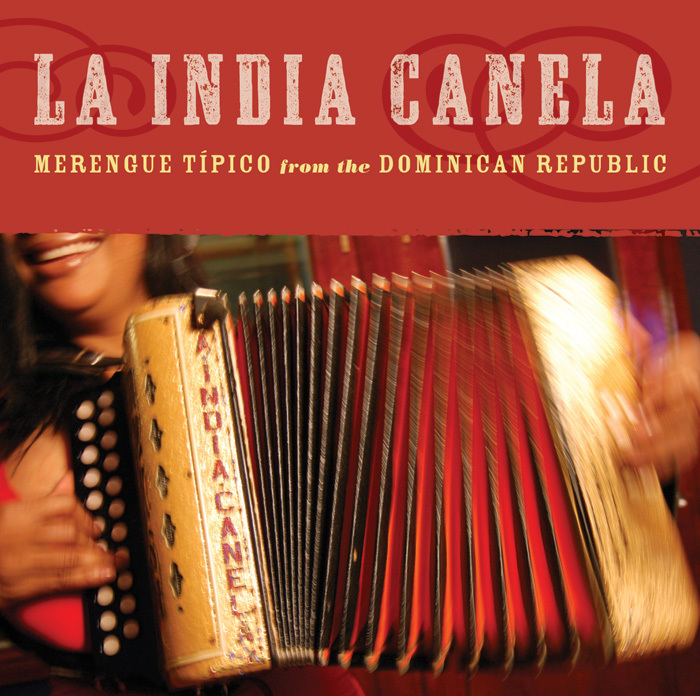 With the 2008 release of La India Canela: Merengue Típico from the Dominican Republic, La India is a dynamic contribution to this legacy.